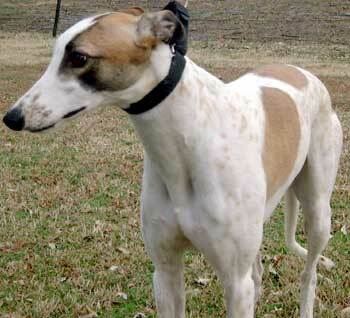 Kelly, aka Copperkettlejudy, is a gorgeous brindle/white, 2-year-old female greyhound, born April 3, 2002. 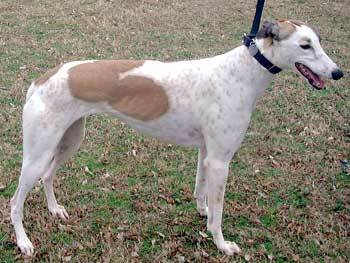 Kelly's sire is Gable Dodge and her dam is Joe's Lady, with her grand sire being, of course, Wigwam Wag. Kelly's racing career was all at the Valley Race Park in Harlingen in December 2003, and ended when she broke her hock on December 27. She has been in a cast, and is just now trying to put weight on her leg without the cast. Kelly has a rich, friendly personality. She is putting more weight on her leg and her leg is getting stronger. Kelly's foster mom says that Kelly ignores the cats in the house but not outside. She may be considered cat trainable. She is very interested in small dogs, and does well with large dogs. She's a real lover girl and is very friendly. Kelly is a big-time tail wagger and is such a happy girl. She'll make someone happy as well.